Alter Aeon is a fantasy world of adventure and untold possibilities. Do you wish to be a mighty warrior, seeking a dragon to slay? A ghastly necromancer, commanding an undead army? A powerful sorcerer? A wise healer? The choice is yours! As a text-based game, Alter Aeon harnesses the power of your imagination. The world is full of exciting places, from the mysterious elemental planes, to creepy haunted tombs and the ancient City of Kings. Join other players and team up to accomplish your goals. Over 600 quests and storylines to experience! A mage, master of elemental magics and offensive spells. A cleric, master of healing, protection, and curses. A thief, master of shadow and cunning. A warrior, master of weaponry and advanced battle tactics. A necromancer, master of undead and demonic forces. A druid, master of runes and nature. Both new and advanced players are welcome. New players will find extensive help, both in-game and online. Advanced players will feel at home with a variety of special features like built-in aliases and equipment sets. The game is also blind-friendly for the visually impaired! Our blind-friendly client works automatically with most screen readers and includes sounds and music. Please see our Blind and Visually Impaired Player Support page for help and client downloads. You'll never run out of things to do or people to talk to in the world of Alter Aeon. Dare you enter? We hope to see you soon in the world of Alter Aeon! Alternatively, you can try one of our custom Alter Aeon game clients, or see our Alternative MUD Clients page for even more options. This alternative client list is kept current and has a lot of options, including some blind and reader-friendly clients. If you can't download or are on a public terminal, you might be able to log in using either our flash-based browser client, or using an ordinary telnet program. 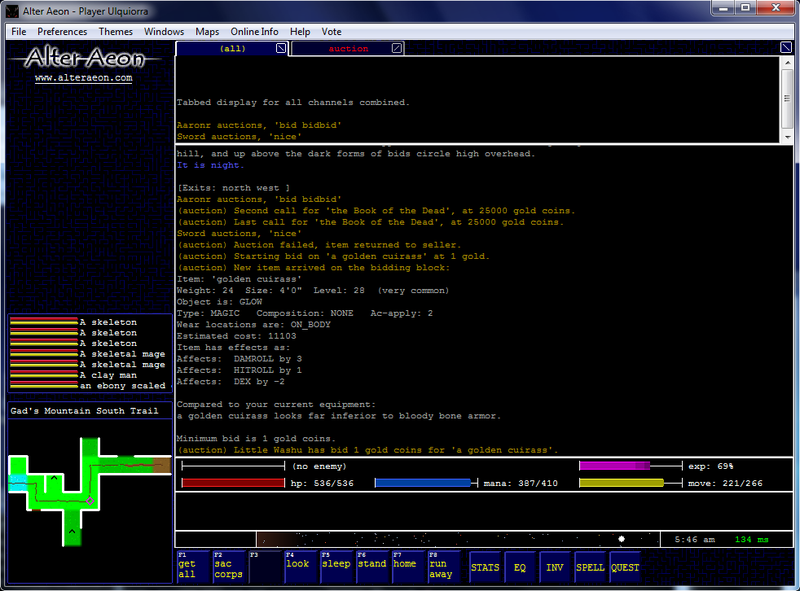 The telnet login is on alteraeon.com, using either telnet port 23 or telnet port 3002. TMS votes are reset once a month, and you can vote twice a day. Thanks for helping support the game!